Which team is the best Cinderella in NCAA tournament history? 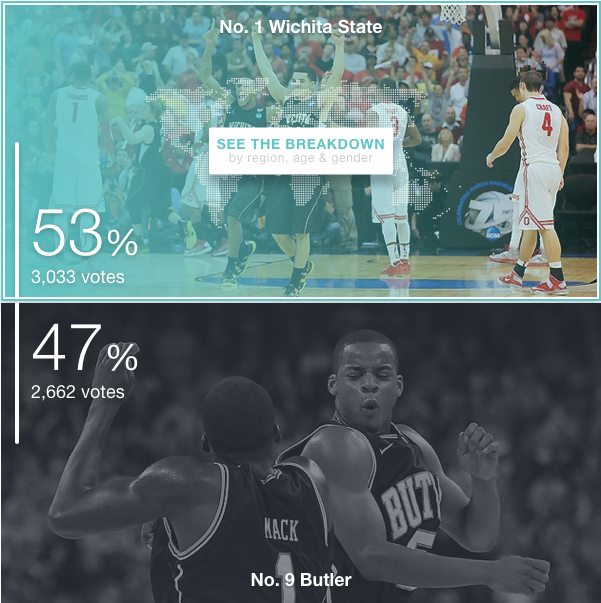 Vote on SI.com's Elite Eight. We've whittled the list of best NCAA tournament Cinderellas down to the Sweet 16, and now we want to hear from you. As Alexander Wolff explained in the introductory essay, we took teams only from the traditional seeding era (since 1979) and only those that were seeded eighth or below in their respective year and eliminated high-major programs (sorry, 1983 N.C. State and 1985 Villanova, then seeded them in our bracket based on Basketball Reference's Simple Rating System. On Thursday, readers voted on our Sweet 16 matchups and created the Elite Eight you see below. 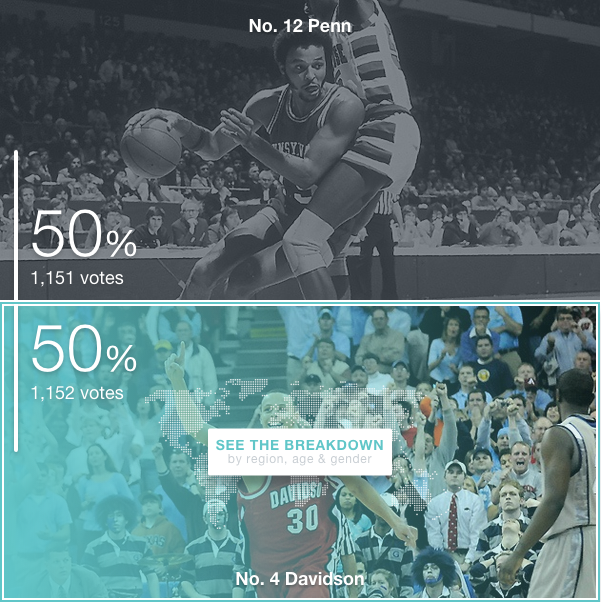 Use the entire weekend to vote for a Final Four, which will be revealed on Monday. Editor's Note: Voting has now closed. Screen shots of the final vote tallies are shown below. NCAA tournament result: Entered the tournament as a No. 9 seed in West Regional. Beat No. 8 Pittsburgh, No. 1 Gonzaga, No. 13 La Salle and No. 2 Ohio State. Lost to No. 2 Louisville in the Final Four. A year before the aptly named Shockers became the first team in 10 years to enter the NCAA tournament undefeated, they heeded coach Gregg Marshall’s call to “play angry” all the way to the Final Four as a No. 9 seed. That anger translated to a smothering man defense that bludgeoned Pitt in their opening tournament win and helped them grind out an Elite Eight victory over Ohio State, but Wichita State’s signature performance may have come when its defense most had its hands full. Facing top-seeded Gonzaga in the Round of 32, the Shockers opened a 13-point first half lead, only to see the Bulldogs rally and take an eight-point lead with fewer than 12 minutes to play. That’s when Wichita State launched a rally of its own, connecting on five straight threes from four different players to pull back ahead for good. NCAA tournament result: Entered the tournament as a No. 8 seed in the Southeast Regional. Beat No. 9 Old Dominion, No. 1 Pittsburgh, No. 4 Wisconsin, No. 2 Florida and No. 11 VCU. Lost to No. 3 Connecticut in the national championship game. The first of Butler's back-to-back runs to the national title game, in 2010, was a fairytale in every way but the ending. Local mid-major with local, overlooked recruits and a stingy-as-hell defense makes the Indianapolis Final Four, comes within a few inches of a half-court heave of beating Duke. The Bulldogs' second run was more surprising than the first; it was unscripted and chaotic, a series of inexplicable saves on the road to an ugly final against UConn. NCAA tournament result: Entered the tournament as a No. 10 seed in the Midwest Regional. Beat No. 7 Gonzaga, No. 2 Georgetown and No. 3 Wisconsin. Lost to No. 1 Kansas in the Elite Eight. Why vote for Davidson? It's tempting just to type "Steph Curry" and leave it at that. Before Curry even played a college basketball game, his head coach, Bob McKillop said: "Wait till you see Steph Curry. He is something special." After breaking the school's freshman scoring record in 2007, Curry racked up 30 points in an opening-round NCAA tournament loss to Maryland. When he returned as a sophomore, Curry was ready to take the Wildcats much further. NCAA tournament result: Entered the tournament as a No. 9 seed in the East Regional. Beat No. 8 Iona, No. 1 North Carolina, No. 4 Syracuse and No. 10 St. John's. Lost to No. 2 Michigan State in the Final Four; lost third-place game to No. 2 DePaul. A newspaper in North Carolina’s Triangle called it “Black Sunday,” so astonishing were the second-round results from Raleigh—No. 9 Penn’s defeat of top-seeded North Carolina within hours of No. 10 St. John’s win over second-seeded Duke at Raleigh's Reynolds Coliseum. But the Quakers were far from finished. A week later, in a Greensboro Coliseum largely empty thanks to the elimination of the local favorites, Tony Price, Bobby Willis, Booney Salters and Co. knocked off Syracuse and St. John’s to land the Ivy League’s first Final Four berth since Bill Bradley and Princeton in 1965. NCAA tournament result: Entered the tournament as a No. 11 seed in the West Regional. Beat No. 6 New Mexico State, No. 3 Michigan and No. 7 Alabama. Lost to No. 1 UNLV in the Elite Eight. The Lions may be the No. 2 seed in our bracket, but in the hearts of many college basketball fans, they are the Cinderella team. During the regular season, LMU was marked by a style of play popularized by head coach Paul Westhead that was run-and-gun basketball at its finest. The Lions averaged 122.4 point per game—a record that seems unapproachable in today's college basketball—and cruised to a 13-1 record in the West Coast Conference. Then, in the second round of conference tournament, tragedy struck. Hank Gathers, who had become just the second player in Division I history to lead the nation in scoring (32.7 ppg) and rebounding (13.7 rpg) in the same season the year prior and who led the nation in scoring again in 1990 (35.3 ppg), collapsed on the court and died of heart failure. Overcome with grief, LMU went further than any team in school history had before or since. Bo Kimble, who transferred to LMU from USC with Gathers and was his best friend, scored 45 points in an opening round 111-92 win over New Mexico State, memorably shooting his first free throw of each game lefthanded in honor of his fallen friend. In the second round, the Lions routed defending champion Michigan 149-115. That's not a typo; they scored nearly 150 points in a postseason game. NCAA tournament result: Entered the tournament as a No. 11 seed in the Midwest Regional. Beat No. 6 Michigan State, No. 3 North Carolina, No. 7 Wichita State and No. 1 Connecticut. Lost to No. 3 Florida in the Final Four. The Patriots of 2006 were old, egalitarian and played asphyxiating defense. A brew of experience and tenacity like that is enough to grind down any foe—and the ability to get stops is particularly useful as a failsafe against bad offense. But George Mason actually wasn’t bad on that end either; it ranked 58th nationally in offensive efficiency, and its raw shooting percentage (48.1%) was good for 15th in the country. Five players averaged 11 points or more, and even though Jim Larranaga’s crew didn’t go much deeper than that, four of the top five scorers shot better than 45% from the floor. NCAA tournament result: Entered the tournament as a No. 10 seed in the South Regional. Beat No. 7 Oklahoma State, No. 2 Alabama and No. 2 Pittsburgh. Lost to No. 5 Indiana in the Elite Eight. Stan Heath knew what it took to win in the NCAAs. Prior to taking over as Kent State’s head coach in April 2001, he had served as an assistant at Michigan State for five seasons, helping the Spartans reach three Final Fours and win the national championship in 2000. But the task Heath took on with the Golden Flashes was essentially the opposite of the one he had at Michigan State. Instead of helping a No. 1 seed stave off plucky mid-majors and other high seeds while advancing through the bracket, Heath was devising ways for his team, from the Mid American Conference, to spring upsets against high-major juggernauts like the Spartans. 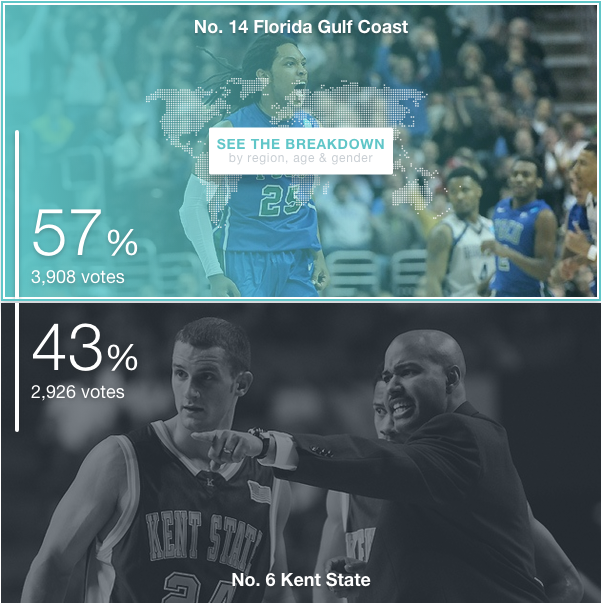 Kent State entered the 2002 tournament hotter than perhaps any other squad in the field. It had not lost since Jan. 9, and it won each of its three MAC tournament games by at least 11 points. NCAA tournament result: Entered the tournament as a No. 15 seed in the South Regionals. Beat No. 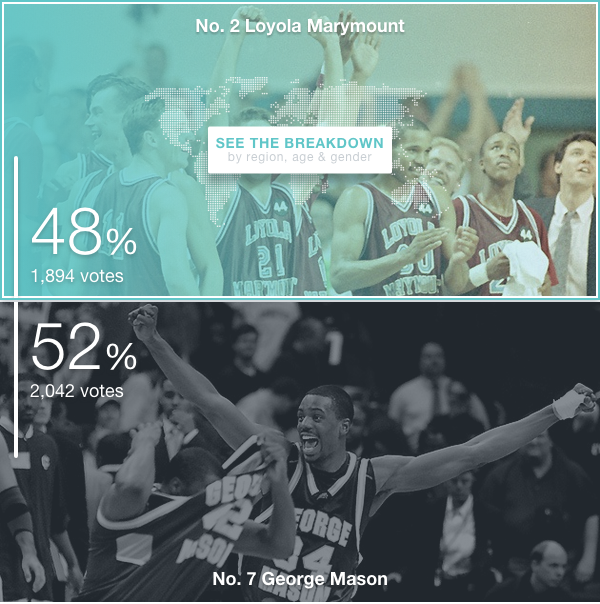 2 Georgetown and No. 7 San Diego State. Lost to No. 3 Florida in the Sweet 16. There are a few dark corners of Dunk City that its inhabitants would prefer you ignore. The first is that the party crashers of the 2013 NCAA tournament were less run-and-gun than run-of-the-mill for most of the year. Per kenpom.com, the Eagles ranked 104th in adjusted offensive efficiency and 109th in adjusted defensive efficiency. What’s more, FGCU wasn’t even even an exceptionally great team in transition; its 1.066 points per possession in that scenario ranked in the 60th percentile nationally, per Synergy Sports Data. (The Eagles, in fact, spent almost 80% of their offensive possessions in the half-court.) But coach Andy Enfield’s crew had three individually efficient offensive players. Guards Sherwood Brown and Bernard Thompson and forward Chase Fieler all ranked in the 83rd percentile or better for points per possession overall—Synergy’s “Excellent” range—and collectively they averaged 1.017 points per possession in isolation scenarios.